Christmas is not a national holiday in Japan, but that doesn’t mean Japanese families won’t be celebrating come Dec. 25. In fact, Japan has one particularly interesting Christmas tradition -- and it’s all about fried chicken. It all dates back to 1974, when Kentucky Fried Chicken began its “Christmas Chicken” campaign, which came after a group of foreigners ended up at KFC upon learning that it was impossible to find turkey in Japan. The campaign was a hit, and now KFC sells a full Christmas dinner -- complete with chicken, wine, cake and champagne -- for about $40. The tradition has gotten so popular that lines at KFC stretch out the door on Christmas. As James Cooper, founder of WhyChristmas.com, told HuffPost Live’s Ricky Camilleri, many even pre-order their chicken dinners. “To get your Christmas bucket, you have to make your reservation,” Cooper said. Since Christianity doesn’t have a long history in Japan, the religious aspect of the holiday doesn’t have much of a draw, Cooper added. 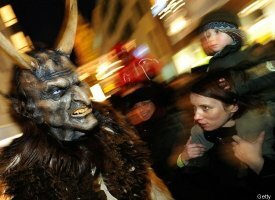 One of the most terrifying holiday traditions hails from the Austrian Alps, where a figure known as Krampus accompanies St. Nicholas on his travels. The sinister, demon-like figure carries a whipping rod and a sack for misbehaved children.